All aspects considered, including the client’s preferences, this painting works the best. The painting establishes the position of the boat, which works better on the right. A fishing boat looks ‘prettier’ and the clouds are light and orangey but still with the blue tones. There are so many possibilities; there could still be a few more of these paint sketches. Now let’s see what the client thinks on Sunday. 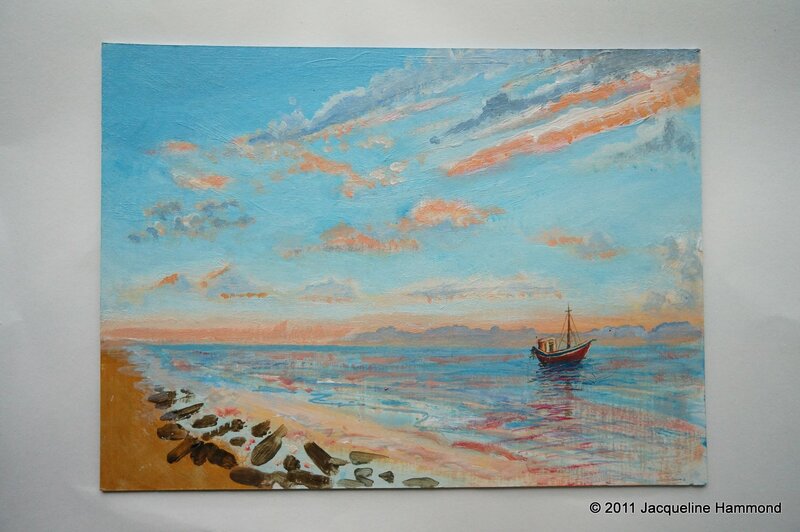 This entry was posted in Art, Painting and tagged acrylics, Art, artist, atmosphere, beach, clouds, colour, commission, fishing boat, gallery, Local News - Brighton, mood, Painting, paints, possibilities, reflection, sea, seascape, sketch, sky, sunrise, sunset, water. Bookmark the permalink.